TSC has introduced the TTP-244 Pro, a four-inch-wide desktop thermal transfer label printer that is 25 percent faster than its predecessor, the popular TTP-244 Plus, yet is available at the same price point, making it significantly more affordable than comparable printers offering far fewer features. The new TTP-244 Pro operates at speeds up to 5 inches per second and features an upgraded stepping motor that is an improvement over the already popular two-motor design of the TTP-244 Plus, whose price-performance combination has made it one of the top-selling print engines in its class. 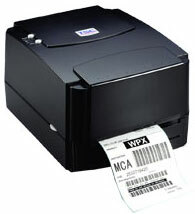 The TTP-244 Pro is designed to print a wide assortment of labels, including shipping labels and compliance and general-purpose product-identification labels and tags, making it the perfect solution for automobile service shops, walk-in shipping and mail centers, stock-room inventory control and numerous other applications. Built to last, the TTP-244 Pro features two gear-driven motors that can easily handle large-capacity 300-meter ribbons and large media rolls. Depending on the volume, operators can use either 4.3-inch OD labels rolls fitted onto a one-inch-core internal spindle or use an optional external roll mount that can accommodate large 8-inch OD rolls fitted onto a three-inch-core external spindle (a size typically designed for use with more expensive industrial label printers). The TTP-244 Pro’s rugged dual gear-driven motors are designed to withstand many years of wear and tear, making it one of the most dependable and durable desktop printers on the market. Like all TSC desktop thermal-transfer label printers, the TTP-244 Pro is backed by an industry-best two-year limited warranty. Across-the-board compatibility with the most popular programming languages. For assistance finding the right TSC printer for your needs, contact us at BarcodesInc.